Additive Manufacturing (AM), or 3D printing, has evolved rapidly in recent years. As new industries have begun to embrace the technology, they are discovering the many ways in which the technology is impacting their business. AM is helping them to reduce development and manufacturing costs; increase production, speed, innovation and time-to-market; produce new structures and shapes; and decrease waste. Let’s take a look at six industries using additive manufacturing to its full capacity—and reaping the rewards. Always on the cutting edge, the aerospace industry was an early adopter of additive manufacturing. As you can imagine, aerospace companies must meet some of the industry’s most stringent standards, and parts and components need to be made of the highest-performance materials. Using AM, engineers can design complex, high-strength parts. In addition, AM helps reduce weight of aerospace components by printing more efficient geometries, thus eliminating significant amounts of unnecessary material. This allows for lower fuel consumption, reduced CO2 emissions, and reduced costs (plus, better airfares). Much like aerospace, the automotive industry is always looking to innovate with newer designs; their products are also subjected to high speeds and harsh conditions. AM printing allows them to develop complex, high-quality parts that can withstand these conditions, offering improved safety. Rapid prototyping also improves vehicle quality, enabling automobile manufacturers to test things like water resistance and high temperatures. In addition, 3D printing allow for parts consolidation, reducing inventory and enabling repair or maintenance to be done with a single part. For marketing teams taking a product from concept to completion, often the biggest amount of time is spent on design. To be sure the product is just right, a great deal of time is spent on creating prototypes to prove concepts to stakeholders and ultimately deliver a consumer-pleasing product. By embracing AM, marketing teams can develop iterations of their product much quicker, and then rapidly pivot to adjust design as needed. Electrical power outages, surges, and spikes are estimated to cost more than $150 billion in annual damages to the United States economy due to labor downtime and loss of productivity and data. Experts at Eaton Energy predict a 5-10% increase in the total number of minutes customers are without power each year until the U.S. electrical grid is modernized. 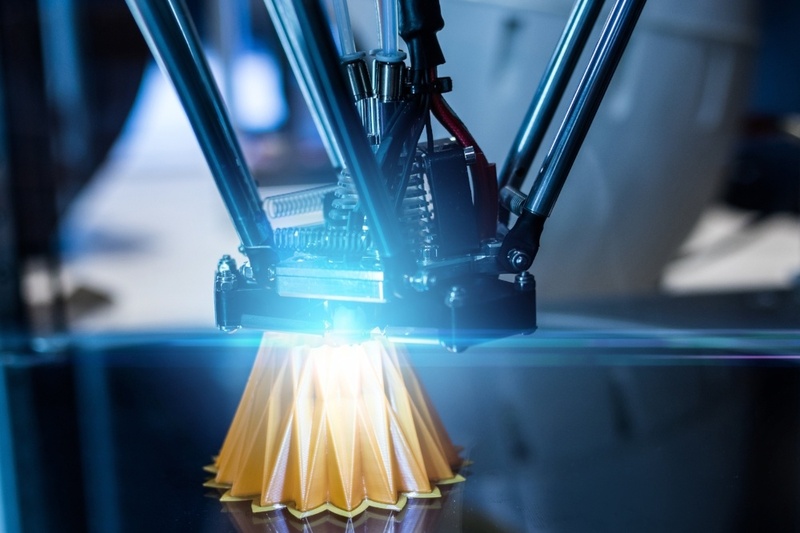 Using additive manufacturing, the energy sector can create lightweight, efficient, and environmentally-friendly components that can also withstand extreme conditions. Plus, AM can allow for the development of corrosion-resistant metal materials for customized parts that may need to experience underwater or other harsh environments. Approximately 75% of U.S. infrastructure—roads, bridges and tunnels—will require renovation or complete replacement by 2035. It sounds like a financial nightmare, but the expense (not to mention the inconvenience to drivers) can be greatly reduced using additive manufacturing. Because AM makes it possible to use no more than the exact amount of materials needed per project, waste is reduced and any surplus of raw materials could then be utilized for the next construction project. In addition to these savings, AM can reduce construction congestion. During any infrastructure project, extra lanes need to be closed to allow large construction materials to move in and out. AM would allow for large-scale structural components to be printed right onsite, even in confined space. This means less interruption to commuters, and lessened safety hazards. Additive manufacturing has revolutionized the medical industry, turning what was once science fiction into a new reality. The technology is delivering breakthroughs to doctors, patients and research institutions. From durable prosthetics and true-to-life anatomical models to surgical grade components, the incredible plethora of objects that have already been successfully printed in the medical field gives a glimpse into the potential that this technology holds for healthcare in the near future. The technology is being used by researchers to print human embryonic stem cells, which are then used to create tissue for testing drugs or growing replacement organs; to print skin that could replace skin that’s been burned or damaged; and to print cancer cells, in order to study them and test out new drugs on them. Surgeon Anthony Atala, Director of the Wake Forest Institute for Regenerative Medicine, has even been working on printing organs, believing that printing an organ may soon replace transplanting an organ. Additive manufacturing is a game changer for manufacturers of all sizes. It can enable them to create products faster, cheaper, with less production waste and better precision. When you look at the bigger picture, AM is also changing the lives of everyday Americans, from medical breakthroughs to safer transportation and roadways. Start growing your business today with additive manufacturing. You can learn more about its benefits to your business by downloading our guide below.